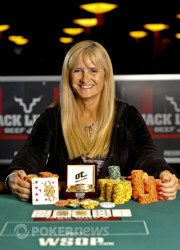 Congratulations Marsha Wolak ($192,344); Event #53 Champion! The crowd is still stunned after what they've witnessed, but we’re now wrapping Event #53 of the 2011 World Series of Poker up less than six hours after we started, as Arizona real estate investor Marsh Wolak sits proudly at the head of the final table posing for her winner’s photos, defeating a field of 1,055 entrants for the coveted gold bracelet and $192,344 in prize money! In fact, the 14 remaining players didn’t mess around from the get-go, with Laura Desantis, Mafalda Lopes, Karen Fisher and Amanda Baker eliminated within the space of half an hour. 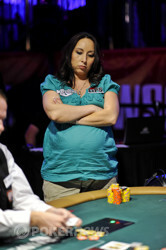 Once the preliminary final table was reached, Amanda Sizemore was eliminated in 10th place after she lost the flip for her tournament life with against Carol Tomlinson’s . Jonathan Epstein, the last male in the field, was then busted in ninth place after he called all-in with , but was unable to improve against Wolak who shoved before him with . With the bracelet now assured a female victor, Epstein was given a rousing send-off by everybody on the rail – one which will be ringing in his ears for years to come. A short time later, Genevieve Gloutnez was sent packing in eighth place when she got her money in with , but ran into Tomlinson’s . Even so, Katherine Stahl, who had been crippled by Wolak in a previous hand, was able to triple up with her after flopping a set of fives, with Tomlinson picking up the rest of Gloutnez’s chips in the sidepot. From there, it was carnage. Jennifer Cowan was the next to go in seventh place after she moved all-in after a flop of with , but Tomlinson’s clairvoyant powers had brought forth the nut straight for her . Tomlinson also took out Stahl in sixth place when her held up against Stahl’s . Valerie McColligan then sent Peg Ledman to the exits in fifth place after Ledman moved the last of her chips in with , but was unable to find any help against McColligan’s . However, it was McColligan that fell in fourth place at the hands of Karina Jett; despite getting her money in with against Jett’s , McColligan had her soul crushed when Jett spiked a king on the river. Wolak then doubled through Tomlinson to take the chip lead during the three-handed battle, with Jett also applying the aggression. Left with only 575,000 in chips in the last hand before the dinner break, she moved all in with , but despite both players pairing up on the board of , Tomlinson was sent to the rail in third place, leaving Jett and Wolak heads-up. And although they agreed to take an early dinner break and refuel in preparation for the battle, the war was over in just one hand. After Jett raised from the button and Wolak called to see a flop of , Wolak checked to Jett who moved all-in with . Wolak snap-called, showing down and she then improved to a straight with the on the turn. The blanked out on the river and with that, Jett fell oh-so-short in second place, but it was a stellar effort, considering she’s final tabled this event twice in previous years and came runner-up this year with a baby on board! That’s not to take anything away from Wolak, as she is certainly a worthy winner. As she celebrated with her friends, she described it as “great justice” – she was knocked out by Shaun Deeb in the 2010 edition of the Ladies Event, so to have taken out Epstein this year on the way to the title could be considered "karma" – well, as The Micros would have you believe. Stay tuned with us as our coverage of the $50,000 Player's Championship continues, plus all the action from every bracelet event and of course, the Main Event. Until then, thanks for tuning in, and may the flop be with you! Marsha Wolak takes down the crown over Karina Jett. WOW! That was certainly not what anyone expected! On the very first hand of heads up play, Karina Jett raised to 60,000 on the button and Marsha Wolak called from the big blind. The flop came down and Wolak checked to Jett who bet 70,000. Wolak quickly announced, “All in.” Jett didn’t take long before she said call and her tournament life would be at risk as the players turned over their hands. Wolak was ahead with top pair and an inside-straight draw against the open-ended straight draw of Jett. The rail was surprisingly and utterly quiet as no one seemed to really grasp what was going on with everything happening so quickly. The turn was the which gave Wolak her straight but still, the crowd was silent. Jett would now need one of the four remaining aces or three nines in the deck to give her a higher straight and the double up. The river was...the and just like that, Jett was eliminated in 2nd place. Wolak screamed and ran over to her rail before she went over to Jett and the two hugged and congratulated each other. Not long after, in their typical fashion, Wolak's rail cheered, "Marsha, Marsha, Marsha." For her efforts, Jett will take home $199,010 and improve on the back to back 4th places finishes that she had in this same event in 2003 and 2004. We congratulate Jett on her performance. The WSOP gold bracelet is now on the table and both players have just returned. There is just over 20 minutes left in the current level and play has resumed. Karina Jett and Marsha Wolak have agreed to take their 60-minute dinner break before commencing heads-up play. The tournament clock has been paused with just over 20 minutes remaining at the current blind level and we will resume at 8.10pm PST (GMT -7). Marsha Wolak raised to 65,000 on the button and Carol Tomlinson moved all in from the big blind for around 575,000 total. Wolak made the call to put Tomlinson at risk as the players turned over their hands. Tomlinson was slightly ahead preflop and both players paired up on the flop but it came to give Wolak top pair over Tomlinson’s mid pair. The on the turn changed nothing and Tomlinson was down to an ace or eight for her tournament life. The river was the and unfortunately for Tomlinson, she was eliminated in third place. As Wolak’s rail has been doing for most of the final table, they cheered “Marsha, Marsha, Marsha” who enters play heads up with the chip lead against Karina Jett. Ever since doubling Marsha Wolak up and becoming the short stack, Carol Tomlinson has played very few pots while Karina Jett and Marsha Wolak have been going at it. In one such hand, Jett raised to 55,000 on the button and Wolak defended her big blind. Both players checked the flop and Wolak check-called a bet of 75,000 from Jett on the turn. On the river though, Wolak led out for 150,000 which got Jett to fold. Wolak took down the next two hands with raises preflop. Then when Jett hand the button next, she raised to 60,000 this time and again Wolak protected her big blind with a call. Just like the hand before, both players checked the flop and Wolak led out for 50,000 when the hit the turn. Jett laid her hand down as Wolak took down yet another pot.